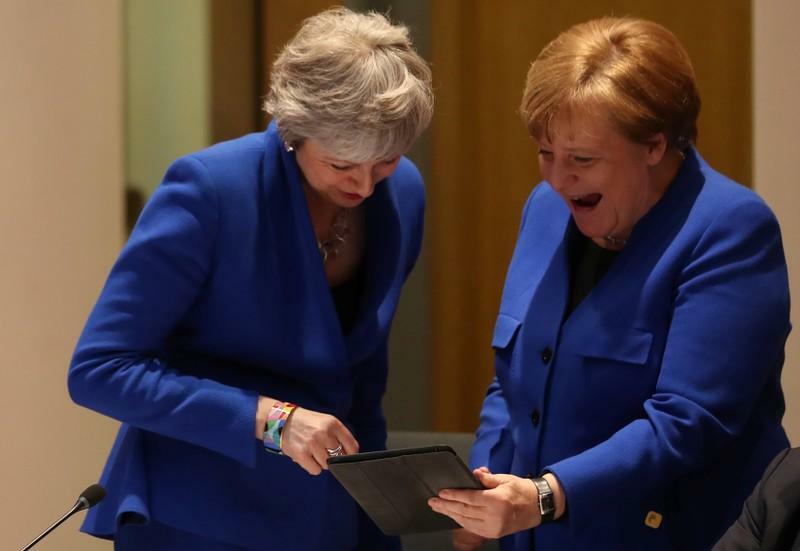 Merkel, 64, showed May, 62, what EU officials said was a photomontage of both women, both addressing their respective parliaments earlier in the day -- and both sporting the similar blue jackets that they were wearing later in Brussels. Cameras on the other side of the table captured them both burst into laughter. The chancellor also shared the joke with others nearby, including summit chair Donald Tusk, before talks got started in earnest. May spoke for an hour, explaining her request for a delay in Britain's departure from Friday to June 30. She was then shown out while the 27 discussed Britain's fate over dinner. French President Emmanuel Macron has led a push to keep May on a tight schedule for departure but Merkel has taken a softer line, saying a no-deal Brexit would be bad for Europe.